I don't use instant messaging that much anymore, but when I do, I turn to Meebo Messenger. This free service, a favorite of mine for years, offers cross-platform instant messaging right inside my Web browser -- no additional software required. It was to my dismay, then, to learn that Google (which recently acquired the company) plans to terminate Meebo Messenger on July 11, 2012. That's just three weeks away! Thankfully, a company called Shape has stepped in with IM+, a free service that offers cross-platform instant messaging right inside your browser -- no additional software required. 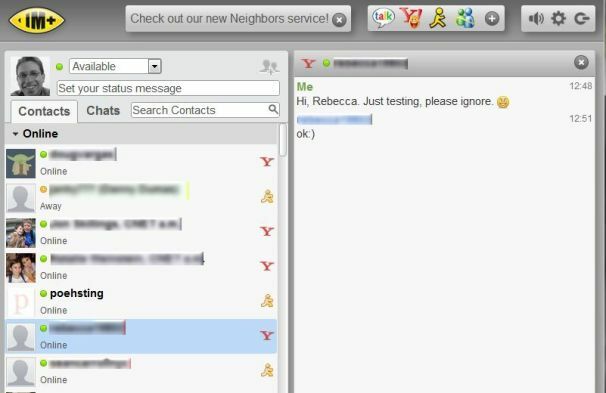 IM+ allows you to sign into one or more of your existing chat accounts, including AIM, Facebook, GTalk, ICQ, MSN, Skype, Yahoo, and a smattering of foreign (i.e. overseas) services. You can do this without so much as registering with IM+, though there's one key benefit to signing up for an account: the service will preserve all your messaging-service info so you don't have to sign into each one manually the next time you return. In other words, you'll just log into your IM+ account, and presto: all your messaging accounts are signed in and ready for chat. Like Meebo, IM+ retrieves your contacts from those messaging accounts, so you don't have to rebuild your friend lists. In fact, your friends won't be any the wiser that you're chatting with them from a third-party service. Another great perk: IM+ can optionally keep a message history, which is great for reviewing chats you've had with business associates or even friends. One area where IM+ falls short: it doesn't let you view multiple chat sessions in multiple windows. You have to bop back and forth between contacts, clicking them in your list to send or read a message. At least there's a separate Chats tab where you can see only those chats that are active, but I definitely prefer Meebo's windowed approach. Update: It turns out there's a setting that does allow for floating chat windows, just like with Meebo. So no demerits on that front! And I neglected to mention that IM+ also allows you to send files to friends, a decidedly handy feature. I did encounter one problem when trying to sign into my Yahoo account, though it wasn't really an IM+ issue: because of changes to Yahoo's terms of service, I couldn't sign in without first downloading and installing the Yahoo Messenger app. Or, at least, that's the error message I got from IM+. But after signing into Yahoo Messenger proper on the Web (something I hadn't done in a while), that cleared the way for me to sign in via IM+. Problem solved. If, like me, you're mourning the imminent loss of Meebo Messenger, take solace in IM+. With any luck, it'll stick around for a while.